Apollo: Man, I won! But I didn't beat him! Q: What is 'Rocky II' about? "Rocky" is truly one of the greatest films ever made. So a sequel to this film would have a tough time following it. Rocky 2 does a great job following up "Rocky" and is truly a great film. The story starts up right where "Rocky" left off. Rocky goes to the hospital and has surgery and it is revealed that further fighting could damage his eye badly and make him go blind possibly. So Rocky settles down, marries Adrian and starts making commercials. Soon Adrian gets pregnant. However soon his ability to not read well costs him his job making commercials and Rocky struggles to find another job. Elsewhere Apollo Creed is furious that so many people are criticizing him for going 15 rounds with a guy who came off that street. So Apollo wants a rematch. Rocky decides that he must fight again, which upsets Adrian due to the health risks he may face. This film succeeds mainly due to the fact that it does a great job continuing the Rocky saga. It starts right up after "Rocky" and further continues the story. It is an awesome follow up. All of the characters are further developed. Apollo Creed is shown more and his character is expanded the most and you get to see what he is like more. Carl Weathers does a great job with Creed in this episode and really plays the upset athlete at the media well. Paulie takes a back seat in this film for the most part but Adrian is very significant in this film as she is the main reason why Rocky is so reluctant to get back in the ring. Rocky 2 is really funny, more so than the first one. Love how Rocky goes around trying to get a job despite the fact that he has basically no education. Also humorous is how bad Rocky is at reading cue cards and what he chooses to talk about at his press conference with Apollo. 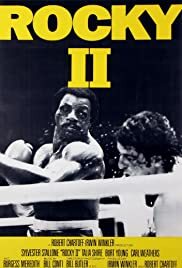 For the most part Rocky and Rocky 2 are more funny than the next films mainly because of how Rocky becomes "civilized" in "Rocky 3" and loses his sense of humor in some ways. 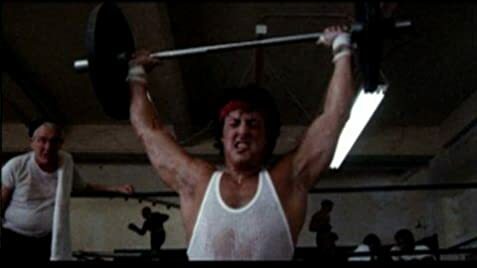 The training that ROcky does in this film is epic. Love the training that he goes through in this film, slamming metal, chasing chickens, and hopping around with lumber on his shoulders. Rocky really works hard training in this film, my personal favorite of his films in how he trains. No film is perfect though. The "Gonna FLy Now" song is not the same as it is in the first film. It is not sung by the same people who sang it is the first film so it is not nearly as good. However this song is only used when Rocky is running, not when he is doing his other training. They use the "Going the Distance" song when he is doing his training outside of his running which is fine. Also the fight at the end of the film is not nearly as good as the fight in the first film. It is mainly just Rocky getting pounded relentlessly and having to overcome a superior athlete. Not like in the first film where it is an even fight for the most part. A great sequel that is funny, further expands the story and characters, and has some really great and memorable moments. A must see and easily the second best film of the series.